Churchill, Manitoba is known as the best place in the world to see Polar Bears. 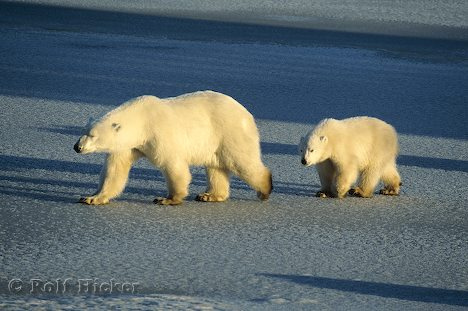 During the summer, the polar bears come on to the land to forage for food. In October/November, they line up along the river waiting for the bay to freeze. Once it is frozen, they will hike 40+ miles onto the ice looking for seals. As a result, the best time to see the polar bears is when they are waiting for the bay to freeze in October/November. In a CNN article, it indicated that people will see 10 to 30 polar bears a day during this time period. With most remote travel destinations, this is not a cheap trip. One tour operator charges nearly $7K (including flight) for a week in Churchill including a stay at a hotel on the Tundra where the bears are located. With a little time and the patience to book your own trip, you can do this trip for a lot less. How best to get to Churchill? You cannot drive to Churchill. Your options are to either fly to Churchill via Winnipeg on Calm Air or take a train to Churchill on Via Rail. It is also possible to drive to Thompson, Canada (7.5 hours from Winnepeg). By driving to Thompson, the cost drops from $440 USD (as of Jan 2016) to $113. One person in TripAdvisor indicated that it might be possible to leave your rental car at the Day Inn. How much does the train to Churchill cost and how often does it run? The train leaves on Sunday and Tuesday from Winnipeg and takes 2 Days and 20 hours. The train coming back leaves on Thursday or Saturday from Churchill and takes 1 day and 21 hours. The total cost of the trip is ~$400 in October/November as of May 2013. The price has since increased to $440 USD ($611 CAD) as of Jan 2016. The train leaves at 12:00 p.m. on Sunday and arrives at 9 pm on Wednesday. You would most likely leave on Saturday train going back to Winnipeg, which gets you back to Winnipeg on Monday. The train departing Churchill leaves at 7:30 pm (Saturday) and arrives at 4:45 pm (Monday). By taking the train, you will need to take off 7 to 8 days off of work. If were to leave from Thompson, the train leaves on Friday/Monday/Wednesday at 5:00 pm and arrives the next day at 9:00 am (16 hours). The train coming back from Thompson leaves at Tuesday/Thursday/Saturday at 5:30 pm. This cost would drop to $113 for a RT fare. How much does an airline cost? The flight to Churchill costs ~$1300 on Calm Air from Winnipeg. It is nearly 3x the price. If you are willing to fly to Churchill, you could minimize the number of vacation days. You could arrive in Winnipeg on Friday night and head up Churchill on Saturday. You could then be there for Sunday, Monday, and Tuesday and head back on Wednesday. This would mean that you would only need to take 2 to 3 days of vacation. According to the CNN article, the average cost in Churchill is about $250 per night. My guess is that you find a basic accommodation closer to $150 per night. It is also worth checking out Airbnb. I found one location for $86 and another for $128. The Bear Country Inn charges $184 per night. While I didn’t reach out to them, the Polar Bear B&B is supposedly one of the cheapest options to stay. How much does it cost to see the polar bears? There are two companies, Frontier North Adventures and Great White Bear Tours, that get you up and personnel with the polar bears. They drive big tundra buggies. 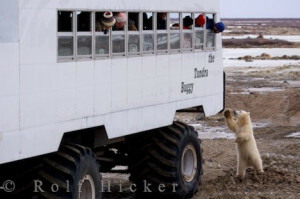 The cost is $340 USD per person per day ($472.50 CDN) to see the polar bears. For Great White Bear Tours, it is critical to book as early as possible to ensure a spot on a Tundra Buggy. Most of their spots are reserved as part of organized tours. The peak time appears to be last week or two in October and first 2 weeks in November. You are picked up at 7:00 AM/7:30 AM from your hotel and dropped off at 3;00 PM. When is the best time to go to Churchill? The best time is October/November, but in particular, it is best to go at the end of October or early November. it is 50% cheaper to plan your own trip than going with a main operator. In my opinion, the difference in price does not justify taking the organized tour. From my research, you have a very high likelihood of seeing polar bears at this time of year and staying at the lodge won’t make that big of a difference. The X factor is how much vacation time do you want to take. There is so much of the world to see. Who offers dog sledding and other activities? This is one tour operator that I found. The afternoon before leaving Churchill, together with other 3 persons, we hired a taxi to visit a private part of the road for polar bear. And, we saw them closely. The entry fee of the private road is $75 per person (only charge when the polar bear is there) and taxi fee is $60 per hour. This is the better way to meat polar bear comparing to the Polar Rover in my trip.